FORT WORTH, Texas – Once again, a sold-out crowd was on hand at The Fort Worth Club for Monday night’s annual Davey O’Brien Awards Dinner. It was a memorable night for the inductees and attendees, who were surrounded by special guests who shared in the festivities. All four of the 2014 award winners, Marcus Mariota, Warren Moon, Christine Vonder Haar and the Hunt Family, were on hand to receive their trophies and speak to a crowd of more than 600 at the black-tie affair. 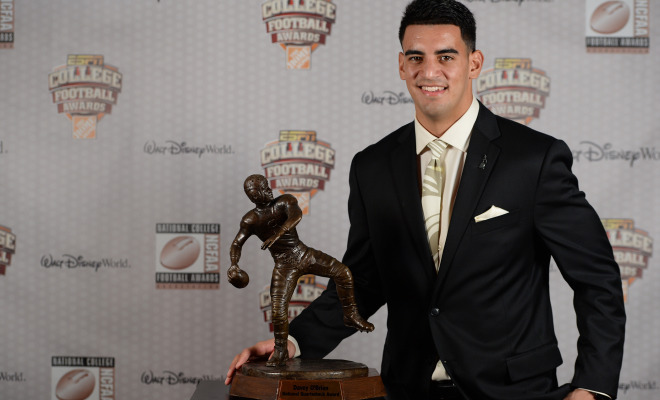 Mariota, who led Oregon to the National Championship Game, became the fifth consecutive Davey O’Brien National Quarterback Award winner to also claim the Heisman Trophy. Moon, the recipient of the Legends Award, was the first African-American quarterback and first undrafted quarterback ever elected to the Pro Football Hall of Fame. Vonder Haar, who ranks second in her class of nearly 600 students, became the third recipient of the High School Scholarship to attend R.L. Paschal High School in Fort Worth. The Hunt Family, represented by Clark Hunt, has been actively involved with the Davey O’Brien Foundation since its inception in 1977 and claimed the 2014 Charles Ringler Founder’s Award. Five past quarterback winners were in attendance to welcome Mariota into their fraternity: Jim McMahon (BYU, 1981), Don McPherson (Syracuse, 1987), Ty Detmer (BYU, 1990 & 1991), Brad Banks (Iowa, 2002) and Vince Young (Texas, 2005). In addition, 2014 Davey O’Brien National Quarterback Award finalists Trevone Boykin of TCU and Dak Prescott of Mississippi State received their finalist plaques. Also in attendance at the 38th annual dinner were 1987 Heisman Trophy winner Tim Brown and Dallas Cowboys head coach Jason Garrett.